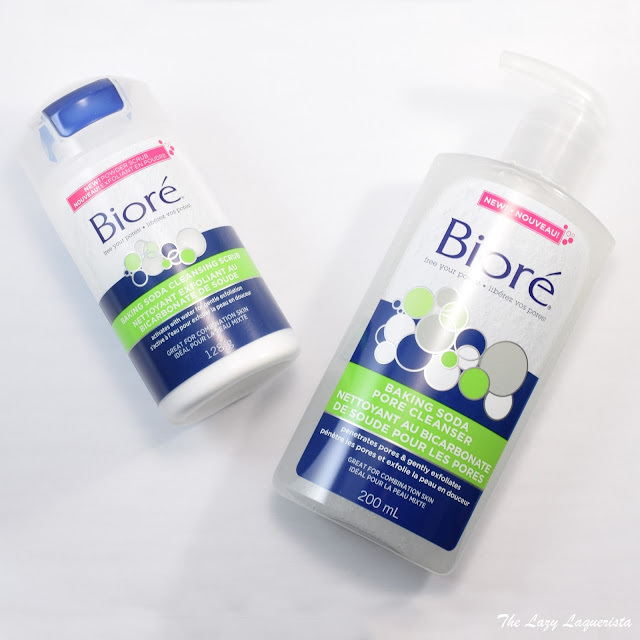 Today I have two new products from the Biore Baking Soda skincare line to share with you, a pore cleanser and a cleansing scrub. Both products emphasize baking soda's ability to deep clean and naturally exfoliate. Let's check them out in more detail. This foaming cleanser is meant to be used daily. The cleanser itself lathered nicely and left my skin feeling clean but not dried out. I was a bit disappointed to see that baking soda (sodium bicarbonate) was the fourth last ingredient on the list. There's even more fragrance (parfum) in this product than what it being promoted as the effective ingredient. It also had little beads in it for exfoliation. I couldn't figure out whether they were made of plastic or some other more environmentally friendly substance. I didn't find they added much to the overall effectiveness of the cleanser and could have done without them. Overall, this is a decent drugstore cleanser, but if baking soda is what is drawing you to it, there's not much in there. Unlike the facial cleanser, this scrub has tons of baking soda. It's the number one ingredient. With a little warm water the powder turns into a thick foam... almost a gel-like consistency. It has a fine but effective grit and left my skin feeling super smooth. I did find it a bit drying, so just make sure to use a good moisturizer afterwards. Also, the few spots where I had healing blemishes did sting when coming into contact with the scrub, so this may not be the best if you have very acne prone or sensitive skin. For me, that slight discomfort was definitely worth the results.